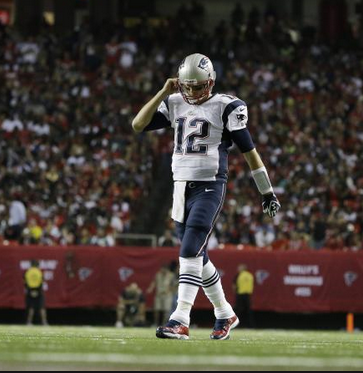 Could the Patriots ever trade Tom Brady? Last week New England traded Logan Mankins, a career Patriot since 2005 who made the Pro Bowl in each of the last five seasons. The Bill Belichick Pats are absolutely ruthless when it comes to letting guys go who they think don't quite have it anymore. Time and time again they've shown they'd rather risk moving on a little too early than too late. Gray: "When you see the organization do stuff like this Tom, do you worry that at some point you're going to be next?" TB: "I don’t think I worry about it, I think I understand that that’s part of the business, and I need to continue to find ways in the offseason to make sure that the team does want me. And if there ever comes a time where the team doesn’t, maybe there’s another team that will." Brady is 37 years old, and under contract for four more seasons counting this one. Dealing a no-longer-elite 40-year-old who's still got big-name value elsewhere would literally be the ultimate test of New England's philosophy. 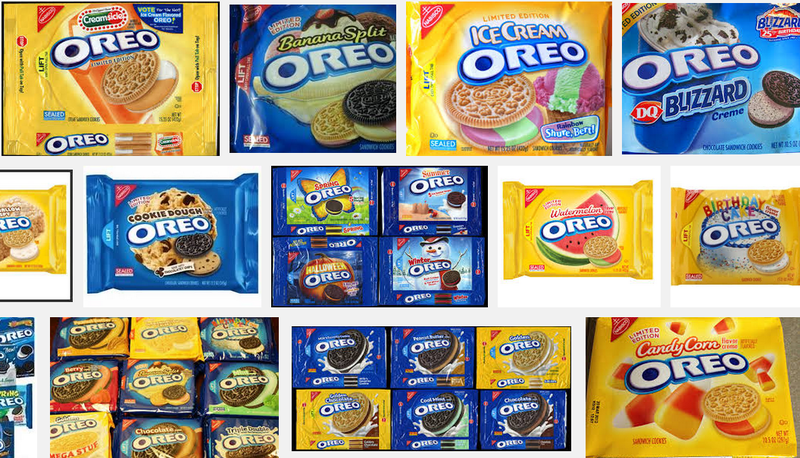 Wikipedia's "Oreo" page lists 38 different flavors of the cookie that have been produced; and I know there's even more than that because it doesn't even mention the sporty Oreos I saw in the grocery store two years ago. I'd guess I've probably tried 10-12 different kinds, and I've never had one that wasn't spectacular. So why doesn't Nabisco make Oreo mix packs? Basic chocolate and vanilla. The two different birthday cake varieties. Mint and cookie dough. Lemon and lime. How about chocolate, creamsicle and watermelon? Freaking awesome. Time to get on the ball Oreo. Maybe the A's should have consulted me before trading Yoenis Cespedes for Jon Lester? "I think it could backfire big time for the A's. At 66-41, Oakland has easily the best record in the major leagues right now. They're a lock for the playoffs. In those situations teams usually look to tinker and add complimentary pieces that could help in the playoffs; a pinch runner, an extra bat off the bench or arm in the bullpen, or maybe a fifth starter to fill out the rotation. You don't usually deal away your No. 3 hitter (and two-time defending home run derby champion) for a new ace of your staff. When you're the best club in baseball, why risk messing with your team chemistry like this? The A's already had the lowest starter's ERA (3.32) in the American League; they seem to have addressed a need that wasn't even there, with the chance of disrupting everything they have going right now." As of today the A's are 79-60, now 4.5 games out of first place in the AL West and only 3.5 ahead of the Mariners for the final Wild Card spot. Oakland has gone 13-19 since making the blockbuster trade. After averaging 133.75 runs per month from April through July, without Yoenis Cespedes Oakland scored just 103 times in August. 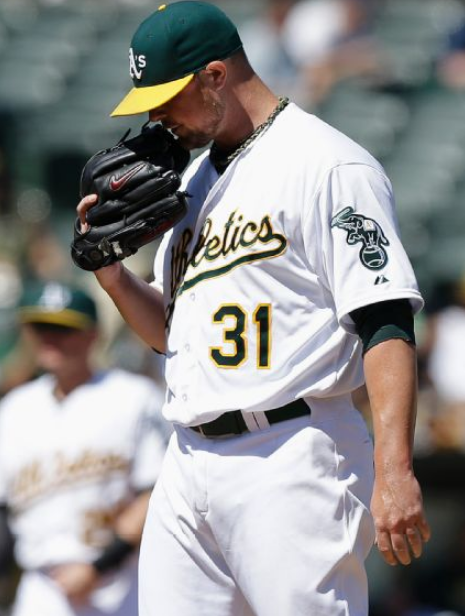 Jon Lester has pitched very well in seven starts for the A's, but despite a 2.59 ERA and 1.03 WHIP Oakland is only 4-3 in those games, and has plated a total of six runs over his last four outings. In World Series play Lester is 3-0 with a 0.43 ERA and 0.76 WHIP over three career starts. The A's may still get there and prove this to be a moot point, but if they miss the playoffs or lose the Wild Card Game the Cespedes for Lester trade will look like an epic disaster. 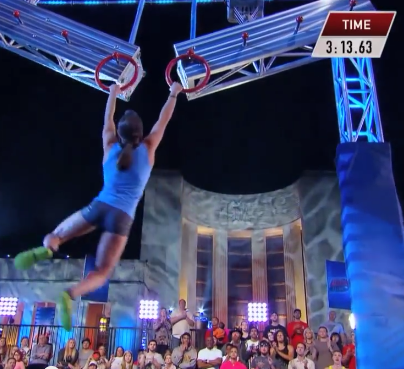 From the bit of American Ninja Warrior that I have watched, it seems to me that the most important attribute for a contestant to have is a tremendous upper-body strength to weight ratio. I've seen many men who were obviously much stronger than Kacy fall because they couldn't hold themselves up (she weighs just 100 pounds). If they had American Ninja Warrior for 5th graders in 1987, I think I would have been an exceptional candidate. I wasn't that strong, but I was ridiculously skinny. I weighed the least of any kid in my class, including the girls (48 pounds is the number I have in my head, but don't hold me to that). I remember going to the doctor and being something like 50th percentile for height, but only 5th percentile for weight (I'll have to check with my mother to verify these stats, she probably saved them somewhere). In gym class one day we did a thing called the flexed arm hang--you hang from a bar with your elbows bent for as long as you can. Decades later my memory of this event is slightly hazy, but I believe the class record was something like 40 seconds, until I came along and shattered it with a time over 2 minutes. Had I realized the implications, that could have been the start of my American Ninja Warrior career. 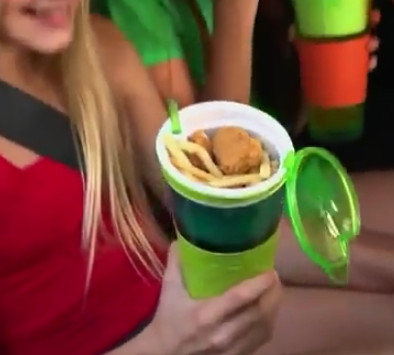 I hope to live the rest of my life without ever coming face-to-face with a "Snackeez"
Quick analysis: I'm pretty sure I could just eat my 4 ounces (the size of the container on top) of nuggets and fries in the same time it would take to try to cram them all in there. Does anybody own a Stone Wave? Last week Jackie MacMullan was on the ESPN show "Around the Horn." During the course of filming she engaged in an off-air conversation (but still on camera) about the Celtics possibly trading Rajon Rondo. Among other things, she said "it will happen because he's told them he wants out. And no one believes me, but that's the truth." Afterwards the show posted a video of the conversation on YouTube. A few days later a Celtics beat writer noticed the clip and wrote about it. Then other media outlets started to cover the story. As more and more sources began to publish Jackie Mac's thoughts, the "report" gained credibility. 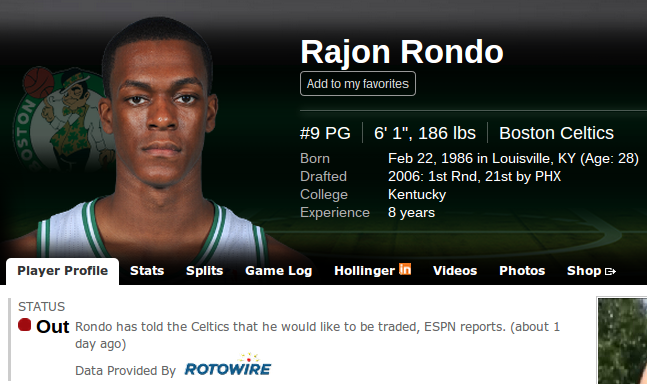 ESPN never reported Rondo asked for a trade. MacMullan didn't "report" it either. She stated her opinion off the air. The YouTube video doesn't even exist anymore because of the stir it created, but the widely popular fantasy sports news service Rotowire used it as a source to write the above update. The hilarious icing on the cake is that ESPN publishes Rotowire's player news, allowing the "worldwide leader" to credit themselves for reporting a story they never did in the first place. 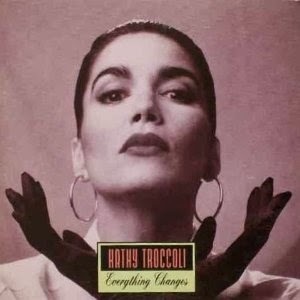 According to Wikipedia, Kathy Troccoli is a "contemporary Christian music singer, author and speaker" from Brooklyn who attended Berklee College of Music in Boston in the late 1970s. She also apparently really really loves Jesus. But until reading that I only knew her as the person who sang Everything Changes, which peaked at #14 on the Billboard pop charts in April of 1992, and was the only mainstream hit of Troccoli's career. However, she did also provide backup vocals on Taylor Dayne's I'll Be Your Shelter in 1990. If you have a suggestion/request for an "Awesome Old Song of the Week," hit me up on twitter @LucidSportsFan, or by any other way you know how.